Galene goes West: To Puerto Rico! We didn’t mean to go to Puerto Rico! ( Sounds like an Arthur Ransome novel!) Honest we really didn’t, we wanted to go to the Virgin Islands. With a good forecast for the next 5 days (light and from the east) we are on our way to the Virgin Islands. 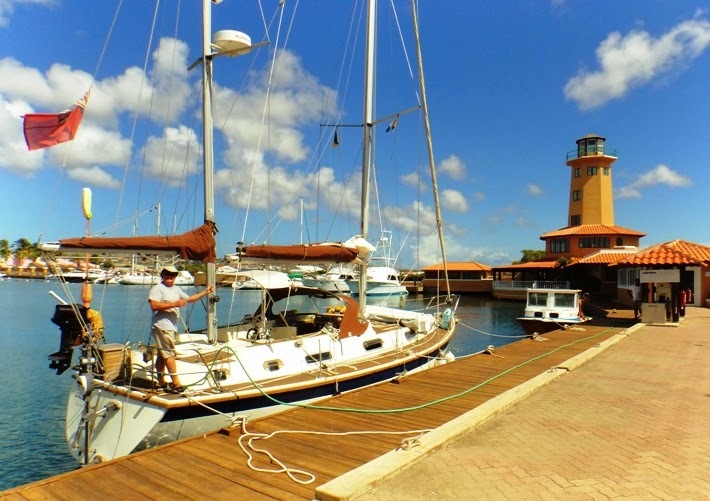 After leaving Bonaire on Thursday 13th about noon we arrived in PONCE, PUERTO RICO at 0800 on Tuesday 18th after the sail from hell. We had never intended to go to PR after our experience last year but a combination of weather and sheer exhaustion we are back in Ponce! Thursday was nice and calm and we sailed slowly north easterly. Friday there was very little wind so we motored due east. Saturday started ok with a north easterly wind so we were not making much easting. Sunday was a day of squall after squall 30 knots plus and very heavy rain from the north east. Fortunately we put the second reef in on the main Sunday evening as the wind increased to F6 NE with 3m plus seas. We were crashing off waves and crashing into waves with waves breaking over the bimini and dumping in the cockpit. For a while we were just below leaving Galene to fend for herself. Fortunately 'Arry the Hydrovane does not mind steering in these conditions. This continued all through Sunday night, Monday and Monday night. 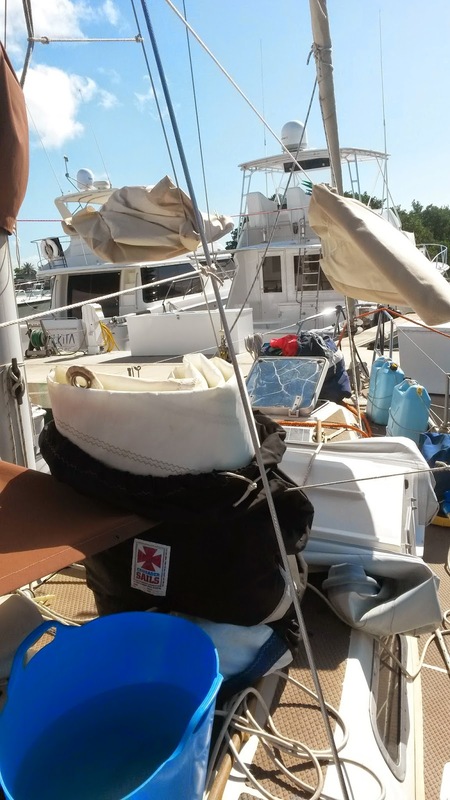 We slowed the boat down to reduce the slamming and possible damage. By now we were so exhausted that we resigned ourselves to going in to Ponce. We just really needed to stop. We sailed slowly so to arrive in daylight, dropping the sails in the channel entrance and motoring to the fuel/customs dock at the yacht club. As usual the yacht club people were lovely and this time the customs were much nicer and even smiled. They seemed more relaxed about the garbage and confessed that they no longer have a facility on the island to dispose of foreign garbage. When they discovered we were going to the USVI’s they said to keep just any of our meat tins that we open and dispose of them there, as they have the facilities!! It helped that Paw Paw and Campechano are here too. Campechano (another Cat) told us their story of breaking both the dagger boards. They were making so much leeway without them that they would have been blown to the Dominican Republic! Fortunately their home port is Salinas just up the coast from Ponce and the yard at Ponce will be able to make the repairs. We realised we were lucky not to have suffered any damage, having only a rather damp boat. So we are here for a while washing off the salt and getting rid of all the sea weed including the bits in the main stack pack and generally drying out - back to being a boat not a submarine. We have made a modification to the anchor locker drain to stop it draining into the forepeak lockers. We still drain into the bilge now via a long hose, but at least the locker contents will hopefully stay dry if we play submarines again! As for Christmas, the way I feel now it will probably be at Ponce Yacht and Fishing Club. I am sure they will do a good deal for a long term berth and we have 6 months on our US visas. After this sail, which was worse than the Atlantic, I don’t think I want to be at sea for a while. After a week at Ponce we are on the move again, Paw Paw and Campechano have gone to Salinas and we will catch up with them there hopefully. 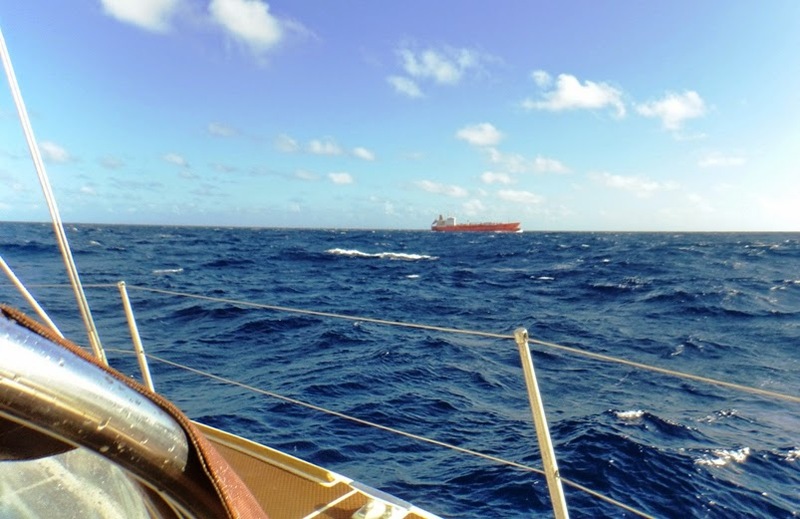 Heading east we will have to motorsail and will leave at first light to get there before the trade winds pick up at lunchtime. Once again, the forecast is not accurate and we are bounced around in heavy seas until past Caja Del Morte when all we have to deal with is a horrible choppy sea. We arrive at peaceful Salinas lunchtime on Thursday. It is the Thanksgiving holiday and very quiet. Anchored up amongst the mangroves it is a beautiful spot. Hopefully we will see a Manatee here? The Marina has a bar and restaurant and there is a shopping centre about a mile or so walk away. Our plans are to stay here a few days before moving east again. We wanted to go to Vieques and Culebra on our way to the Virgin Islands. 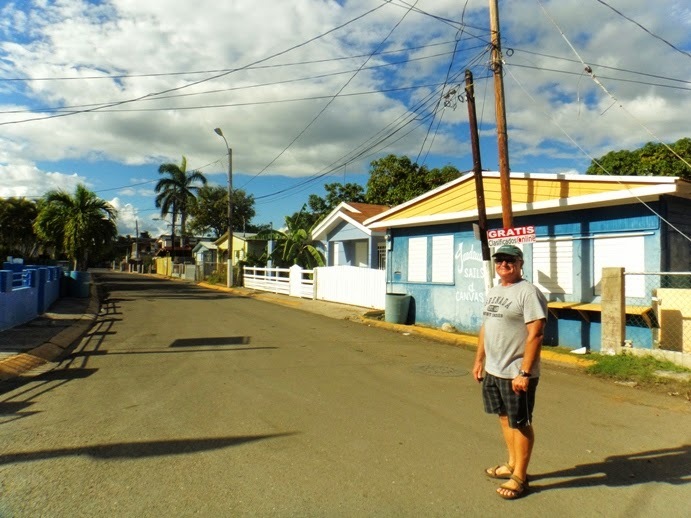 The locals here say that Vieques is no go due to the crime associated with the drug scene that seems to have become established on the island. 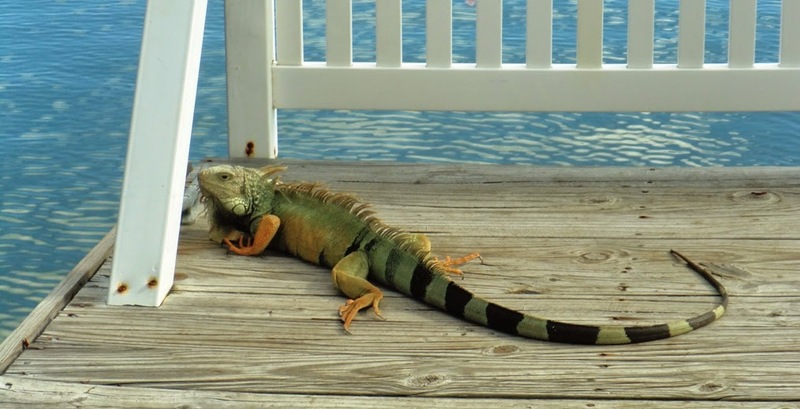 It looks like we will give it a miss and go on to Culebra. Mornings we have breakfast with manatees! Unfortunately they did not come very close to us. All you see is a nose poke up or a tail disappearing very quietly, but still a privilege to see. Ospreys, frigate birds, Royal terns, pelicans, grey herons and cattle egrets fly over all the time. Fish and rays are jumping – it is really a lovely anchorage. The only thing is the water is a bit green, though clear, so we don’t fancy swimming. There is a laundry at the marina, a swimming pool and a nearby bakery which also has basic provisions. There are dozens of restaurants all round known for their seafood. Water and fuel are available at the marina - when they eventually get a fuel delivery! Also a nice little bar with wifi and food set amongst the mangrove trees. Watch out for the seedpods falling on your head! 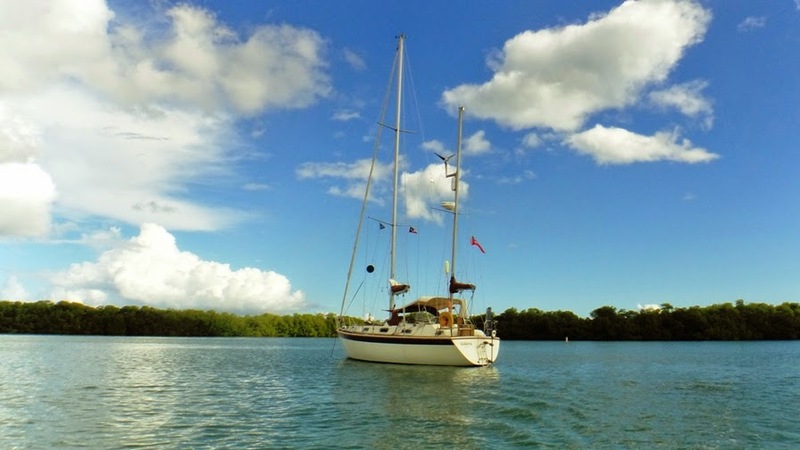 We plan to leave Salinas at first light on Wednesday 3rd December towards Culebra. The forecast looks good, but as we know, anything can happen!